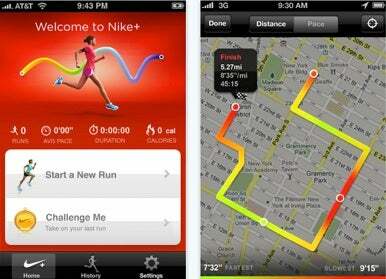 Nike has released Nike+ GPS, a new app for runners, in the App Store. As the name promises, this new app’s main advantage is live GPS tracking while you run. It can track your route and upload it—along with the rest of your run data—to Nikeplus.com, Nike’s Web service and community for gadget-enabled runners. Nike+ GPS also includes a Challenge Me feature that’s designed to help ambitious runners push themselves. If you run three miles, Challenge Me will push you to run 3.5. Run five miles, and Nike’s app will move the carrot just a little farther. There are a few likely reasons for why Nike decided to release a separate Nike+ app when it already got Apple to build one into iOS. For one, this new app does not require the purchase of a Nike + iPod Sport Kit—it relies solely on device hardware like the GPS and accelerometer. As a result, iPhone and iPod touch users now only need to consider purchasing a $2 app versus a $30 kit (iPod nano owners, however, will still need the kit). In addition, with increased competition in the exercise-tracking market from the likes of RunKeeper, Runmeter, and others, a separate app that is no longer dependent on Apple’s iOS updates for new features allows Nike to stay nimble in the App Store. Speaking of stores, more Nikeplus.com users means that Nike can collect more data about runner’s habits for its products, and a few of those new users might just stumble over to Nike’s store and buy some gear, too. Currently, iOS’s built-in Nike app offers at least one feature that Nike+ GPS apparently does not yet—tracking walks in addition to runs. Nike+ GPS is available now in the App Store for $2 and requires an iPhone or iPod touch running iOS 3.1 or later. GPS-mapping features require an iPhone 3GS or iPhone 4, and iOS 4 is required if iPhone owners want to use the GPS to track runs while the app is in the background. Other features will work on a second-generation iPod touch or later.